James Gordaneer at Winchester Modern in October, 2012. James Gordaneer is an well-respected Canadian artist, living in Victoria. 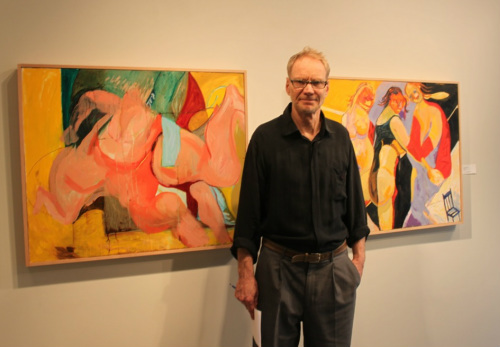 His career as an expressionist painter and art teacher spans over five decades. James now works comfortably from home. "Alice" by James Gordaneer, Oil on Board, 18.5” x 14.5”, 2012. "Journey to Copa" by James Gordaneer, Oil on Panel, 30” x 36”, 2012. While in hospital, recovering from a stroke, Jim spent many hours ruminating about his painting practice. “I made a vow that I wasn’t going to paint the same way,” he says. He decided to focus his compositions by simplifying the forms and shapes. James also brightened his palette, adding visual impact and a celebratory mood to his paintings. James paints intuitively without a preconceived image in mind. He starts each painting with mark-making, breaking up the surface of the canvas with a felt-tipped pen. Next, he sketches out shapes with a round bristle brush and burnt umber paint. The unfolding shapes are gradually filled with colour. “This takes focus and concentration,” he says, “the colours speak and I’m led on by the unfolding composition.” Jim paints for two or three hours each morning and completes a painting in about three days. growing up in the depression meant no luxuries in the home. But always on the dining room table was a pad of white paper which he filled with his drawings. James left school half-way through grade nine to work in a grocery store. He took night classes, then enrolled in the Doon School of Fine Arts, starting as a summer student and ending up as faculty. For several winters in the 1950’s James painted with other artists in San Miguel d’Allende, Mexico. In 1957 he spent several months in Ibiza, Spain, then traveled to Paris, and visited major art museums around Europe. “This was an important part of my education,” he says. Peter Redpath (above) manages Winchester Modern at 758 Humboldt Street. Winchester Galleries Ltd., has three locations in Victoria. Owners Gunter Heinrich and Anthony Sam opened their first gallery in 1994. The fine art dealers of historical and contemporary Canadian have an international clientele. Peter Redpath's research and writing skills on Canadian artists, past and present, is evident on the Galleries’ promotional material. Peter spent many enjoyable hours with James Gordaneer sorting through paintings for the exhibition. “We are so lucky to have an artist of this stature in Victoria,” says Peter. Sumo by James Gordaneer, Oil on Board, 30” x 36”, 2012. Sumo continues the wrestling themes found in past work. Peter notes that the variety and subtlety of flesh tones shows a mature technical ability. The interesting shapes of the interlocking bodies make a visual puzzle. Three women predominate over a small chair in this dramatic composition. In Purple Chair the three female figures are pushed together by strong diagonal lines to create one complete unit. The purity of colours adds to the visual impact. Web Design, Content and Photos: Kate Cino previewed arts events for 18 years at Boulevard magazine.